Enjoy this low-carb healthy version of pudding sweetened naturally with a fruit compote. In a medium-size saucepan combine coconut milk and chia seeds. Heat until it just begins to steam, remove from heat and add maple syrup, vanilla and sea salt and optional collagen powder. Let cool on stovetop for about 45 minutes and then place in fridge to continue to cool for another 30 minutes, stirring occasionally. Mixture will begin to thicken as it cools. Meanwhile, in another medium-size saucepan combine strawberries, rhubarb and water. Bring water to a boil and reduce heat to medium-low. Continue to cook fruit to soften and reduce for about 10 minutes. Add additional maple syrup to taste, if desired. Cool fruit for 10 minutes and then use an immersion blender to puree into a smooth compote. Compote should be the consistency of a thin pudding. If not, continue to cook some of the liquid off over medium-low heat, stirring about every minute until desired consistency. 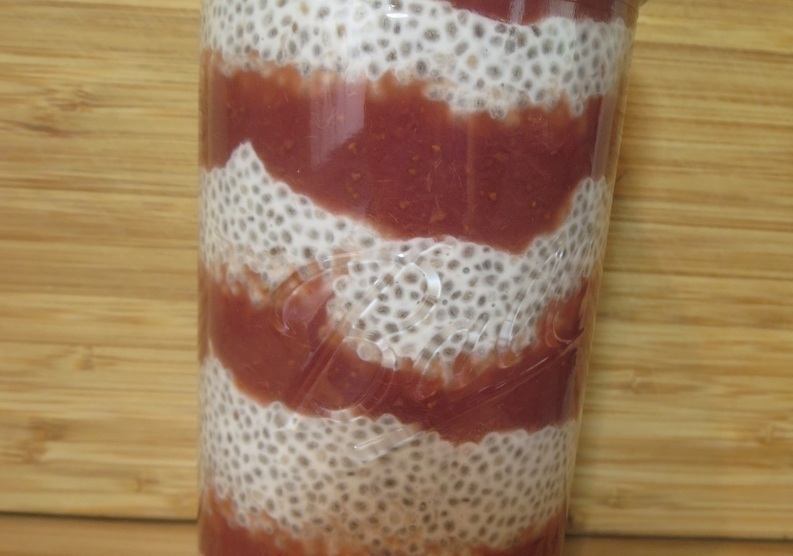 Using an asparagus jar or another container layer the chia pudding alternating with the fruit for a total of six layers. Chill for at least 3 hours before serving.